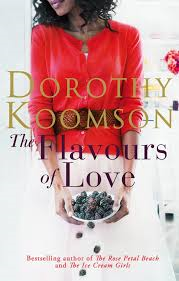 The Flavours of Love by Dorothy Koomson follows the tragic story of Saffron Mackleroy. 18 months ago her husband was murdered and the killer was never found, Saffron is now trying to deal with her grief as well as keep working to keep a roof over her family’s heads and if that wasn’t enough she is then called into her 14 year old daughters school to be dealt another hand of devastating news. Trying to deal with all of this alone is more than a little challenging and so the last thing she needs is letters from the killer. Can Saffron protect her family or have things gone too far? It took a while to get into this book mainly because of the structure of it as it constantly jumps through different periods of time from the present day to then various time periods before or after husband Joel’s murder. Once I got used to the layout I then began to enjoy the storyline and before long I was intrigued and found myself flying through the pages. The story is told from Saffron’s point of view so we really get to know her on a more personal level, I wouldn’t say I connected with her character but I think this is because of her loss she has put barriers up to protect herself from people and I felt that these barriers were also up between her and the reader which I actually found was a great touch. I loved the suspense that Koomson creates in this book, each time I had my suspicions about someone I soon was being led down another path which then put someone else in the frame. There are so many different situations in this book that you are constantly on edge waiting for something else to be thrown in the mix. There are various delicate situations that are included in this book and each of these were written about in great detail and felt very realistic, I have never read a book with so many delicate, challenging situations included and written about so well. This is a great book if you are looking for something slightly chilling and unpredictable.